If you are tired of your children jumping on their beds or sitting on a couch playing video games every day, you should consider your option to purchase a trampoline for them. There are a lot of great options available and all of them are much safer than you may have had when you were growing up. One of the most popular trampolines available is made by Skywalker Trampolines. The reason it is so popular is easy to see. It is safe and provides children with endless ways to entertain themselves in the great outdoors. Are you ready to discover how the Skywalker Trampolines Jump N’ Dunk trampoline can get your kids up off the couch and out of the house? This is perhaps one of the most affordable trampolines available. It is not overly difficult to set up, the spring hook makes even the springs easy to connect. It is safe because the safety net is attached at every spring, which is rare for traditional style trampolines. There are a variety of sizes available to choose from, but overall the 15ft, round trampoline is more than enough jump space for most people. This trampoline is fairly lightweight and that is perhaps the biggest complaint. Many people feel the jump n’ dunk trampoline has to be tied down, especially if there is potential you will have a storm rolling in. The other side of this is that some people like that it is lightweight because it is easy to move when you need to mow under it. Overall, the Jump N’ Dunk trampoline is one that most owners are glad they purchased. It is not perfect, occasionally there is a missing piece or a defect, but customer service seems really helpful and everything is taken care of quickly. Once it is put together, everyone says that their children love jumping on it and most use it daily. If you want to know more about what other people think, you can read more owner reviews here. If you would like to see other options, please see our best trampoline basketball hoop article. 21 Fascinating Facts About Trampolines – Exercise, Education, and More! How Much Does a Trampoline Cost? 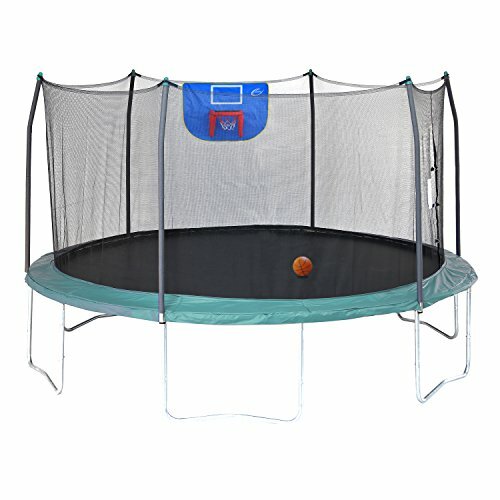 Trampolinereviewguide.com is a participant in the Amazon Services LLC Associates Program, an affiliate advertising program designed to provide a means for sites to earn advertising fees by advertising and linking to Amazon.com. Trampoline Review Guide Copyright © 2019.